This "modern marvel" has all the elements of a mountain retreat mixed with new furnishings! Meadow Stone Lodge is absolutely the number one preferred vacation rental in Kirkwood. The reason is you are located in the center of all the action from cross-country out the back and getting on the lifts in the front. This home is particularly special because the views are to die for and the open living room makes for a wonderful gathering place for your family and friends. Fresh new construction also shows it best with granite counters, radiant floor baseboard heating, wood windows and a balcony facing the meadow. This home is a three bedroom with a loft for extra sleeping and fun times for the kids. Meadow Stone Lodge is located just steps from one of Kirkwood Mountain Resort’s best known chair lifts, Cornice Express. Comprised of 34 rustic luxury residences, Meadow Stone Lodge offers luxurious two, three, and three bedroom plus loft condominiums, each outfitted in rustic style and equipped with all the comforts of home. The romantically tall towers surround a natural landscape of aspen trees and a stone-laden creek that greet guests as they enter the covered parking garage and entry lobbies. 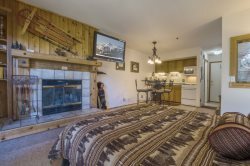 At Meadow Stone Lodge, you’ll stay just steps from the resort’s premiere downhill ski area as well as the Kirkwood Meadow, where you’ll find ample space for snow play and well-maintained cross-country and snowshoe trails. Heated driveways and sidewalks provide safe, easy building access, even on the stormiest days. Upon arriving, you’ll find warm, welcoming hallways and plenty of luggage carts to allow you to unpack your gear with minimal hassle. 3 Bedroom + Loft - Sleeps 10 - 2,172 square feet. We provide the following amenities- GE Advantium appliances, dining table seating for 8, dishwasher, gas stove, microwave, coffee maker, basic pots and pans, dishes and silverware. 42" Flat Screen TV with Roku and DVD/Bluray; No Cable. Meadowstone #402 , Kirkwood Village, CA, Video produced by Tahoe Real Estate Photography for Pyramid Peak Properties from Tahoe Real Estate Photography on Vimeo. Great condo, right in the heart of the base area! Super family or group friendly!